This company has answered all my questions and helped me find the best plants for my area. Will order again in the future. Cant rave enough about customer service, they are great to work with and took my order over the phone. Perfect plant for anyone who has to have a deer-proof yard. I have it in a huge container and it very quickly grew to perfect size. Second bloom season is spectacular. Pachysandra Procumbens or Allegheny Spurge is part of the Buxaceae family and is a native of the Southeastern United States. It is said that this is one of the more popular plants that are used for ground coverage, best to be planted in a shaded area whether its under a deciduous tree or along a shaded riverbank. It may have a problem with leaf blight which may need fungicidal application. Root and stem may also occur, and aphids may pay a few visits, please bear in mind that these only indeed happen when that plant is not taken care of adequately. You will often see them growing around river banks and shaded slopes. It also tolerates drought and dense shade. 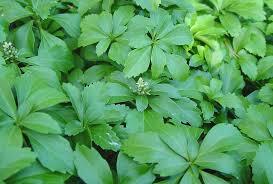 Pachysandra Plant makes a beautiful ground cover because of the width that it can spread. As it grows and blooms, it provides a beautiful look at the bare ground is covered with small green leaves. When it blooms, it gives small white flowers that appear in the spring and summer months. Homeowners and gardeners love this plant because of the ease it is to grow and care. They also grow to become very dense and thick. Known by its common name, Allegheny spurge, Pachysandra Procumbens (Pachysandra procumbens L.), is native to the Southeastern United States. It is a herbaceous perennial most often used as a ground cover. Pachysandra Plant is one of the rare plants that grow in dry conditions in partial to full shade, although it does better in moister conditions. A low maintenance plant, it is perfect for naturalizing in gardens or areas dedicated to native plants. Pachysandra Plant grows from eight to 12 inches high and spreads by underground rhizomes, eventually forming a dense carpet of its blue-green leaves that have purple and white mottling. Leaves are slightly egg-shaped, about three inches long, toothed at the terminal end but not toothed at the base. Fragrant but tiny greenish-white to all white flowers bloom in two- to four-inch spikes in early spring, before new leaves unfurl.l. 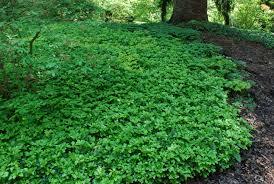 Pachysandra Plants spreads like a carpet.